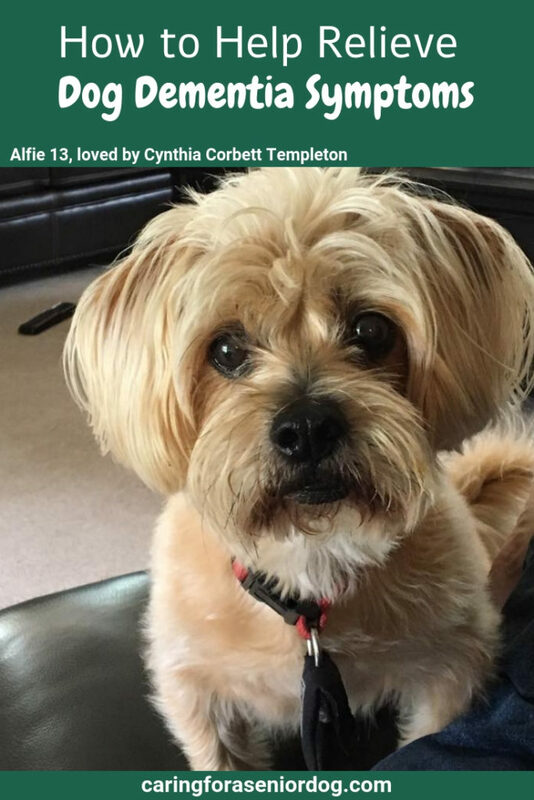 The love of my life, Red, lived with dementia for 2 ½ years and I was always looking for ways to help relieve her dog dementia symptoms. 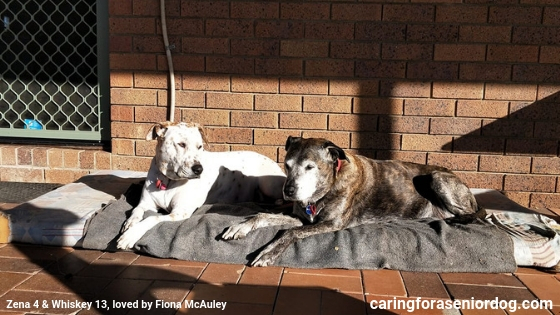 I’ve written a lot about my experiences and struggles with canine cognitive dysfunction. I say “my” because dementia doesn’t just affect your dog, it affects everyone living in the house and in your circle. Red’s dementia diagnosis, made by me BTW, was such a shock, but the biggest shock came when my vet said there was only one treatment available. I like options and hearing there were none was a bit scary, okay frightening, especially because there was obviously no guarantee this “one” thing would work. The treatment I am referring to is Selgian, the prescription medication available here in the UK and Anipryl, available in Canada and the United States. I’m afraid I can’t speak for other countries. 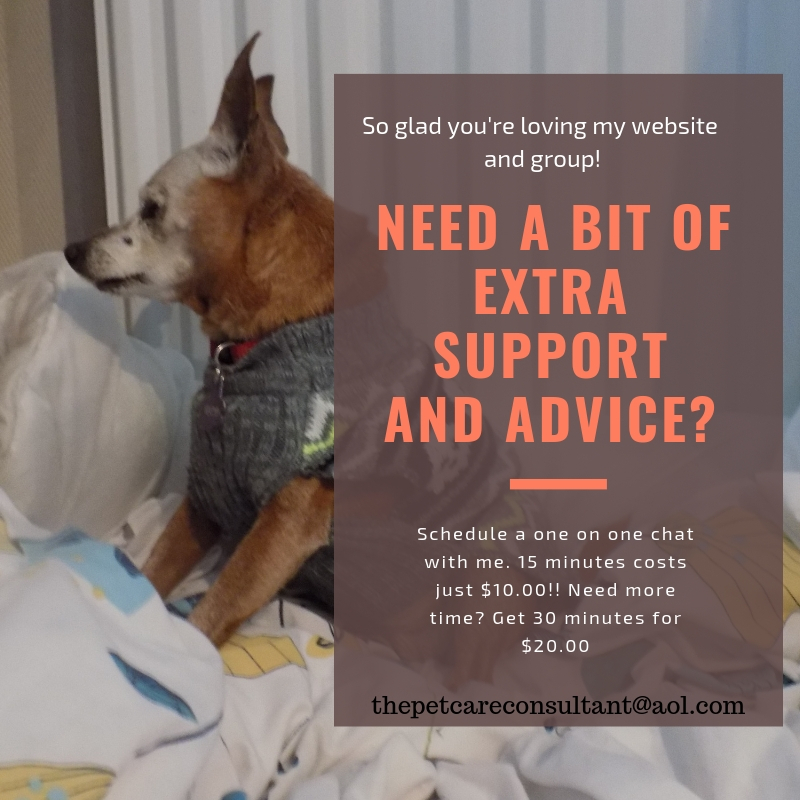 The next biggest shock came when I started my Facebook group for senior dog parents, Senior Dog Care Club. There were so many stories from members who spoke about the apathy of their vets when it came to helping them care for their “golden oldies”, not to mention being told there was nothing to be done for dementia. The number of animals who must be suffering needlessly is too much to bear. I know from my own experiences many vets won’t recommend a medication if they don’t feel it works for enough animals, or the evidence is anecdotal. While I intellectually understand that attitude, I disagree with it because what if it would have worked for my pet and I didn’t know about it? Don’t worry, there are options! Thankfully there are many alternatives and natural treatments available, so you do have options. Because of the climate we live in, and I don’t mean weather, I have to write this. First of all, I have no personal association with this company. I am also in no way suggesting you take matters into your own hands, throw caution to the wind and try every snake oil treatment you might have read about. 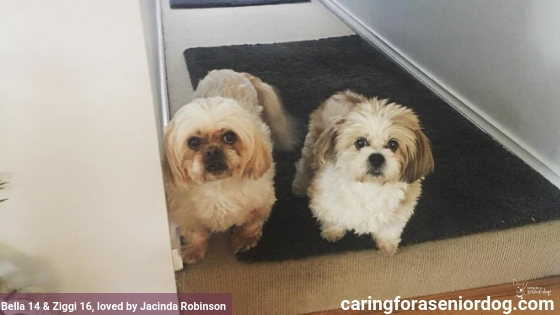 What I am suggesting is to find yourself a vet who is compassionate and caring towards senior animals, do your research, join a group, read about others experiences and make a list of what makes sense to you. Then have a conversation with your wonderful vet and talk about what you’d like to try. A holistic vet is also a great option to consider. Have you heard of Senilife? I’ve read many stories reporting great results, including from members of my group, so I felt it was important to delve into this product a bit more deeply. Let’s take a look at what each of the 5 components are and how they combine to help with aging brain issues. Explanations for each component are in quotes and also taken from the website. I came across this article, “Improvement of short-term memory performance in aged beagles by a nutraceutical supplement containing phosphatidylserine, Ginkgo biloba, vitamin E, and pyridoxine.” Okay I know the title is heavy, but you might find it of interest. I know the heartbreak of watching a much loved pup live with dementia, and wanting a guarantee that XYZ will work. I wish I can say this will, but the truth is I have no idea. What I do know is, just because it didn’t work for one dog doesn’t mean you will have the same outcome. What I also know is how happy I am products like Senilife exist. There are so many positive results, in my opinion it’s worth a try, but please speak to your vet about it to make sure the ingredients won’t conflict with other medications your dog may be taking. Can Senilife be used as a preventative? The makers of Senilife believe you should start giving it to your dog as soon as he or she reaches “senior” status, but what age is that? Opinions vary, especially with all the mixed breeds out there, so this is the guide provided by the company. Will it guarantee your dog won’t get dementia? I don’t think anyone is in a position to make that claim, but it may postpone it, slow down its progression and lessen the symptoms. Is it easy to administer? It comes in a capsule which can be given whole in food or a treat, or emptied into/onto the same. Many dogs are too smart for their own good and refuse to eat anything that has “foreign” matter in it. No matter how you try and disguise it he’s not falling for it! I know because I live with one now! If your dog knows when you’re trying to slip him something, this post has lots of helpful ideas to outsmart him. Where are the negative comments? Of course there are negative comments, it’s to be expected, and they were from people who didn’t see any results, and that too is to be expected. As long as my vet felt the ingredients were safe for my dog, I would absolutely give it a try. Imagine if this was “the” product that made a difference in your dog’s life! So what’s it going to be – yay or nay? **There are affiliate links in this post, which means if you purchase anything I may make a commission. This has no effect on the price you pay. I have a chocolate lab mix, she is approx 14 yrs ( she was a rescue..so not sure of age), she no longer settles at night, pants, paces, barks at nothing. I was unaware that these were signs of dog dementia, thank you so much for your posts. I am in Canada so cannot get the Senilife, but I will be asking my Vet for an equivalent. Here’s to finally getting a night’s sleep again. Hi Christine, Senilife is available in Canada on Amazon. 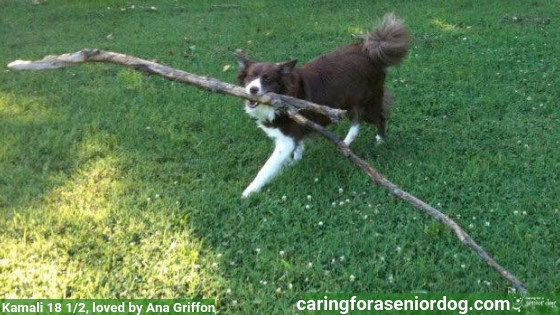 What a fabulous post, I had no idea there was anything created or even recommended for dogs w/ dementia. This really touched me, not only because my own dogs are starting their senior years but because my Mom had Alzheimers. It is the worst disease, worse than anything physical – it robs you of your memories and experiences, which are the very thing that make us who we are. I dread the thought of that ever happening to my dogs, but I’m so glad there would be something we could try. Tweeting, Pinning, & sharing on Facebook! Thank you Cathy. It really is nasty but there’s no guarantee every dog will get it so I hope you’re not worrying!! The good news is, once you’re aware of the symptoms you know what to keep an eye on and treatment can be started quickly. I find it encouraging how many options there are, and thanks so much for helping to spread the word. There are always options even though it might not always be obvious and even when a vet only recommends one. Goes for about anything. Very few vets go over all options out there. You’re right Jana. Once Red started getting sick I realised as wonderful as my vet is, he doesn’t know everything about every treatment option. That’s why I think it’s so important to have a community of senior dog parents to share possibilities we may not be aware of. I have a Facebook friend whose dog recently passed. She had dementia and it was a heartbreaking diagnosis. If there was a chance something would help my pet I’d give it to them. It is very sad. I know many people prefer natural options and I like that path as well, but when it comes to dementia I don’t care if drugs are involved if it’s going to help. Great that there is a medication to help. I had no idea about dementia in dogs so this is an absolute blessing. I didn’t know anything about dementia either…until Red go it. It’s such a nasty disease thankfully there are options to try. We have a senior dog and a friend told us about Senilife. We have it but haven’t started giving it to him yet. This is a very helpful article! Hi Rachel, if your dog is exhibiting dementia symptoms I wouldn’t wait to start him on it. I was reading on the Senilife website they recommend giving it to dogs as soon as they become “senior” even if they don’t have dementia. I would speak to my vet before doing that, by I always recommend consulting with him or her before trying anything new. I take gingko for my own mental state (I don’t have dementia, just lots of stress and anxiety lol). I think a lot of what is in this product would definitely be helpful. I hope someone reads the post that needs it. Do you do any guided meditation? I find it very relaxing when I can bother doing it! I never owned a dog but I can definitely attest that when my cat Dusty fell ill with cancer and I was given no option for a cure, I searched hi and low for alternative holistic natural solutions. I was lucky that my vet was compassionate and understanding enough to work with me to incorporate the methods I wanted for my cat with their traditional medicine. Although,she still wasn’t cured, I know trying alternative supplements gave her a better quality of life and more time than anticipated. For that I was gratful. I think it’s interesting that Ginkoba and Resveratrol are beneficial in dogs too. I’ve heard these work well in humans , but didn’t know it works for animals too. Good news! I know you’re a great pet parent, so of course you searched for other options to help Dusty. I’m really glad they made such a difference in her life. Sadly too many people just accept what their vet says without questioning. There are so many great natural options out there that, as you know, can significantly improve quality of life and sometimes even extend it that’s why I think it’s important to research and even see a holistic vet as well. As long as lines of communication are open between everyone involved so the pet stays safe. Thank you Hindy for the kind words. It really warms my heart. I absolutely agree. As long as communication is open and you have a caring vet that puts your pets needs first, everyone can benefit. The key is a “caring” vet, and in my naive days I believed by definition every vet would care and have compassion. Sadly I’ve seen from my own experiences, and read those of others that isn’t always the case. If any of my dogs get dementia, I will give this a try. If it doesn’t work, I’ll simply pass it on to a rescue. I think it would be worth a try. As long as its safe for your dog, why not give anything a try that could help and you’re right, if it doesn’t work there are plenty of animals in need who could benefit. Senalife sounds like something that may be of assistance to some with senior dogs who may be experiencing dementia. It sounds like it would be worth a try. 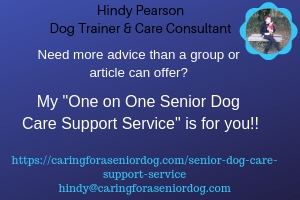 It does sound like a great option, and I’ve heard from lots of group members who say it’s helped their dogs with dementia symptoms. I’m so sorry Diane I have no idea. Do you know why she’s not eating? Is she nauseous for some reason? Has she had a check up and blood tests recently to see what’s going on? I’m so sorry to hear, I know how heartbreaking it is. Did your vet say it was safe to stop the heart medication? It’s definitely not a good idea to ever stop medication without a vet’s approval. Have you had a conversation about your dog’s quality of life? I’m so sorry to mention such a sad topic but it’s important to take a moment and think about how our dogs are doing. We’re so busy looking for the another treatment, sometimes we don’t see whether or not they’re happy.